As Peter travels to his new home with his dad and dog Harold, the reader only sees a dark and forbidding wood. Erin Stead uses various tones of gray to illustrate the things that Peter finds discomforting and threatening. As he looks out his bedroom window each night, Peter sees a bridge and the woods where he believes terrible things live. To protect himself from the dangers hidden there, he creates, out of blankets and pillows, an enormous, very colorful “Guardian of the Bridge.” He names the guardian Lenny and eventually also creates a companion for him named Lucy. Eventually, Peter and his next-door neighbor Millie become friends. Together with Harold, Lenny, and Lucy they wonder and watch out for things they can’t see that might be interesting. Geared for children ages 4 and up. To celebrate September as library sign-up month, the local public librarians visited William O. Schaefer School. Today, I visited with kindergarten and first grade classes at WOS. Many students in these classes have already visited their local public libraries and have gotten their own library cards. Others were anxious to do so. After explaining the process of how to get a card, many students indicated that they would visit their public library soon. Visiting with these young, eager children is always fun. What made this visit extra special is how the library and teaching staff incorporated a lesson in verbal communication with how important it is to visit the library. This Saturday October 3rd from 10-4pm is the Chappaqua Book Festival (click logo to follow link to official event web site). 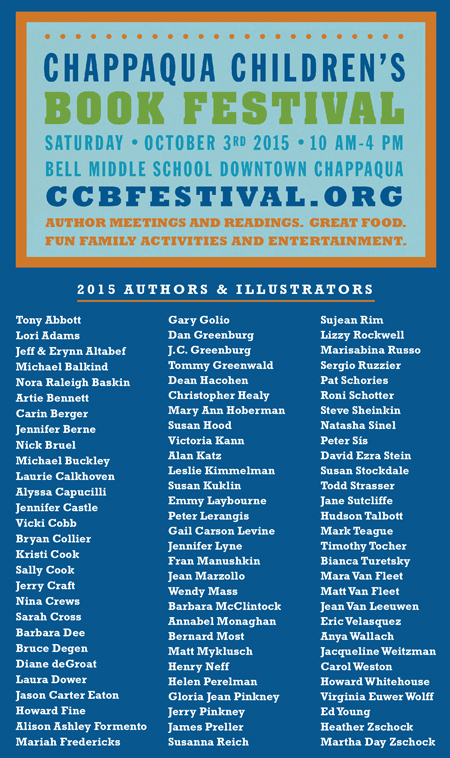 More than 80 authors and illustrators are expected to attend. It is a kid-friendly day with author meet-and-greets, entertainment, and… books! 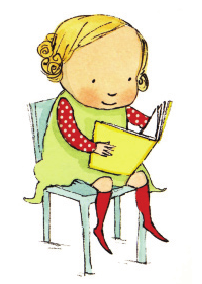 Award-winning authors like Peter Sis and Jerry Pinkney will be there. It’s a great line-up for book lovers of all ages. When New Year’s Day arrives, many of us vow to get organized. This January, Marie Kondo makes keeping this resolution a little easier with the publication of a companion to her still popular The Life-Changing Magic of Tidying Up. According to the publisher, Spark Joy is a comprehensive illustrated manual that answers all of the questions the author/organizing consultant received since the first book and offers in-depth advice on moving and packing. Place your holds now on this upcoming bestseller! The popular podcast Stuff You Should Know is an award winning podcast produced by the HowStuffWorks website which produces many interesting podcasts that are all based around the spirit of learning. The podcast, released every Tuesday and Thursday, educates listeners on a wide variety of topics, often using popular culture as a reference giving the podcast comedic value. This particular episode was “How Book Banning Works” and is an interesting introduction to the topic. Click on the photo to hear the podcast!